Über/unter Ansicht eines portugiesischen Mann des Krieges, eine geleeartige marinen Wirbellosen von der Familie Physallidae. Man of War, also known as Portuguese Man of War (Physalia physalis) is a jelly-like marine invertebrate of the family Physaliidae. 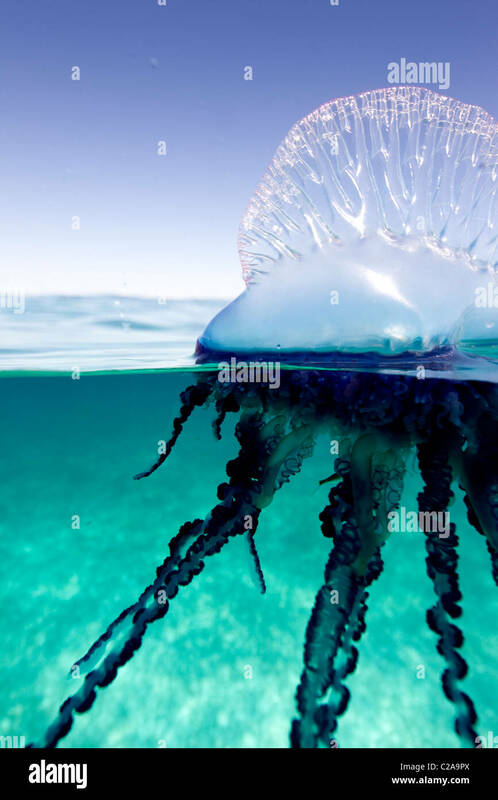 The name "man-of-war" is borrowed from the man-of-war, an 16th century English armed sailing ship, more than likely due to the bladder which acts as a sail for the marine organism. Winds, seas and currents drive the movement of this organism. The Man of War is a jelly-like marine invertebrate of the family Physaliidae. It is not a true jellyfish, but a colonial organism, made up of many minute animals called zooids.